Above: A small stile from the Old Macclesfield Road, just on the outskirts of Burbage, leads down to the site of what was once a busy colliery. The inset map dates back to the late 1890s and shows the colliery was already disused at this time. I find it fascinating to compare old and new images of the same place. It somehow brings the past to life, revealing features of our industrial heritage that have long since vanished from the landscape. I think the fade below is my favourite so far. There’s such a vast contrast between then and now. Then it was a busy working colliery, with coal being unloaded from canal boats onto railway wagons. And coke smelted in nearby ovens on the hillside. Today it’s just a fairly indistinct area of moorland, dissected by the River Wye on its way to Buxton, and bordered by the busy A54. It’s not on any popular footpath tracks, and lies over a wooden stile beside a long-abandoned road. To visit the area, go to the end of Macclesfield Old Road in Buxton until it becomes a rough track. Walk a short distance further, ignoring the first stile on the left going down a fairly steep slope, and taking the second that leads slightly left, along a more level path, towards a small footbridge. On the left, just before the footbridge, are the remains of two coke ovens. The tops of them aren’t visible until you get close to the edge of the slope. There’s a narrow track which leads down to them. But it needs some care as the hillside is fairly steep. 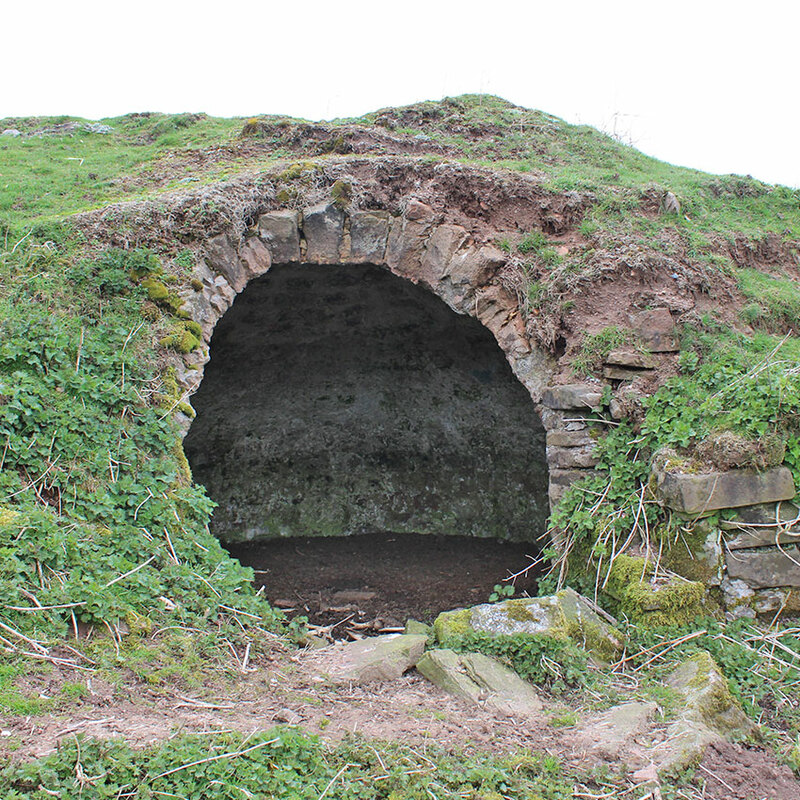 Above: A close-up of one of the coke ovens showing the interior – which appears to be coated with lime wash (click to enlarge). 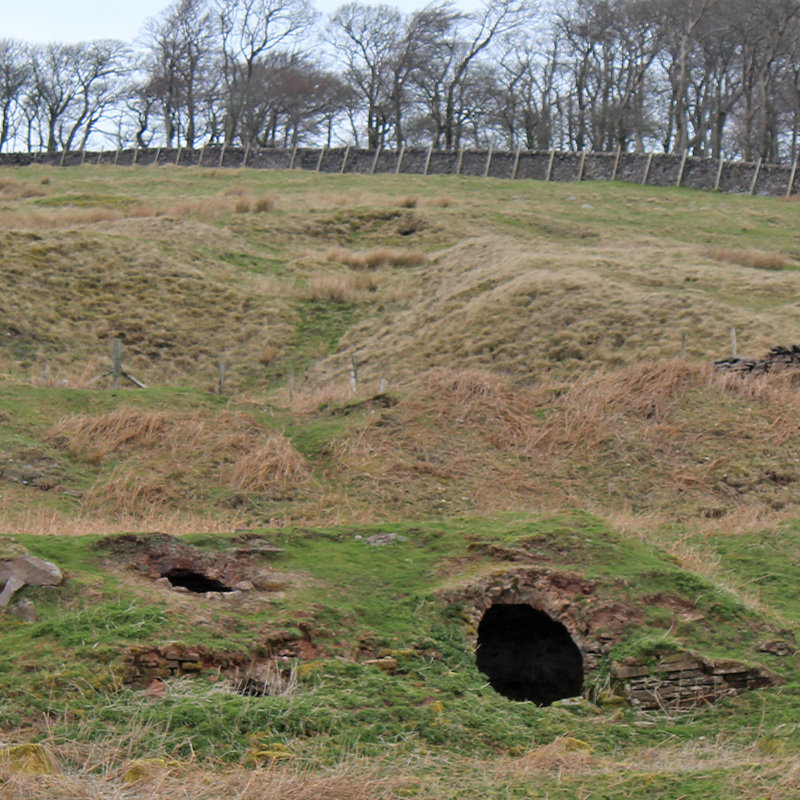 Above: It wasn’t easy photographing the two coke ovens! This was taken from the hillside on the other side of the A54. They’re easier to spot from the road than they are from just a few yards away. I haven’t managed to discover much about the twin coke ovens, beyond the fact that there used to four. (Although there doesn’t seem to be any evidence for the missing two.) I’ll create a separate post if I discover any more details. It’s not possible to see anything of the tunnel entrance. Completed in 1754, this was the earlier of the two tunnels (see previous post for more). It would probably have been blocked up over a century ago, and the moorland has long-since hidden any signs it ever existed. At some stage (I’m not sure when), small canal boats were used to bring coal along the tunnel from the seam. I’ve shown where the wharf must have been, with coal unloaded onto train wagons on sidings connected to the nearby Cromford & High Peak Railway. The sidings are easy to spot today, although it’s only when looking at this fade that I realised the tracks must have crossed the River Wye over a long-vanished bridge. 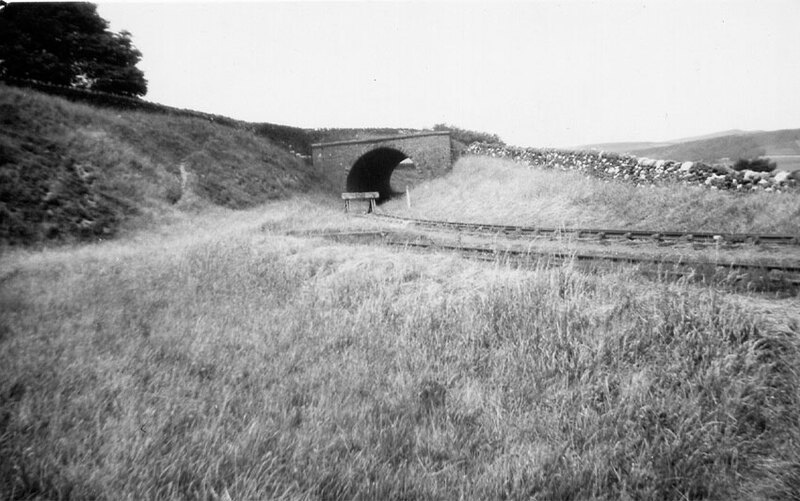 Above: Probably taken in the 1960s, this photo shows the buffer at the end of the Cromford & High Peak Railway, just before the tunnel leading under the Old Macclesfield Road (click to enlarge). The northern section of the line, leading through the tunnel all the way to Whaley Bridge, was closed in 1892 when an easier route was opened. The bridge is still there, close to Burbage Colliery, but blocked at the far end. Out of the picture to the right is the embankment over the River Wye. 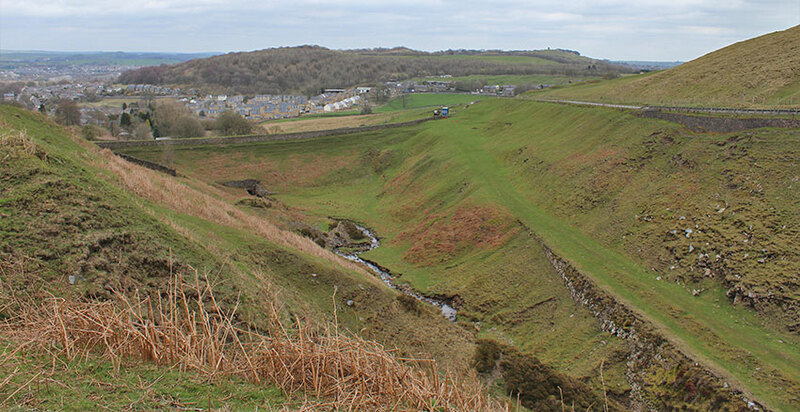 Above: A view from above the coke ovens looking towards the railway embankment which once carried trains between Cromford and Whaley Bridge. The sidings leading down to the colliery are clearly visible on the right. The A54 to Macclesfield lies above. And the River Wye snakes across the valley floor, flowing through a tunnel at the base of embankment (click to enlarge). Above: This rare photo of a train passing over the embankment shows Buxton in the background (it’s just possible to make out the Dome in the distance). It would probably have been taken from beside the A54, but I’m not sure when.